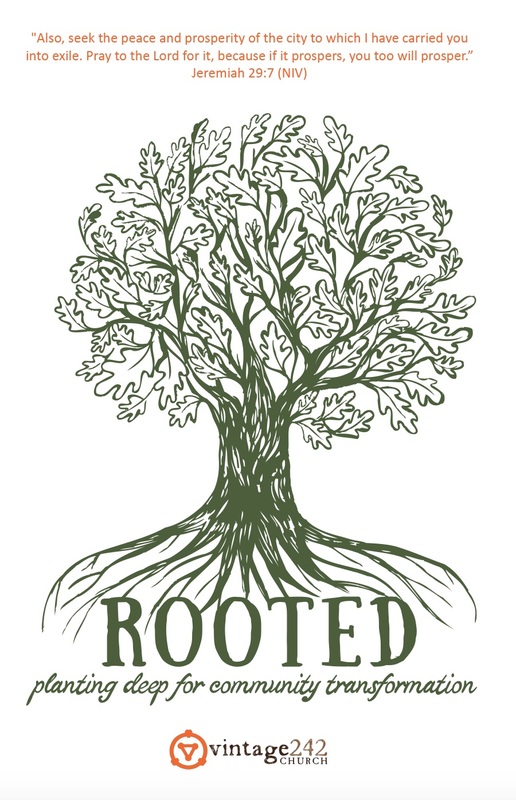 The Rooted Initiative is a two year vision to invest in the mission of God for our community. We believe God has birthed and empowered Vintage 242 Church to pursue and seek the transformation of our community through the love of Jesus. As we look to the future, we are excited! We believe God is speaking clearly about planting our roots deep in our community so we can influence on a deeper level for many years to come. Learn more about what God is doing in and through us now and as we look to the future. We have started a two year journey together towards the fruition of God's vision for us in the Rooted Initiative, and we asking every person in the Vintage family to partner with us in prayer, giving, engagement, and celebration. We take seriously Jesus' words where He tells His disciples "...whatever you ask for in prayer, believe you have received it, and it will be yours." We believe God loves to respond to the prayers of His children; therefore, we are inviting you to unite together with the rest of the Vintage family over the next four weeks to ask, seek, and knock that God would move according to His will in the Rooted Initiative. Our Rooted Prayer Guide includes a different theme for each week and unique scriptures for each day of our prayer journey together. Please take time each day to slow down, focus on Jesus, and pray about where God is leading us in this season together. In the summer of 2009, a small group of families took a crazy step of faith to plant a church in the Cedarcrest community: Vintage 242. With us, we brought only a dream of transforming lives through the love of Jesus - and faith that God would lead the way. He has done so beyond what we could have asked or imagined. Most recently, in April of 2017, we purchased 48 acres of land for the price of 8 acres. God literally gifted us 40 acres of land! We already have so many testimonies of His goodness and faithfulness, and we are anticipating many more as we continue to partner with Him in His mission for our community!